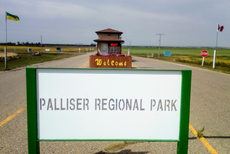 There's always lots to see and do at Palliser Regional Park - check back often for seasonal events! The Farmer's Markets are held at the Camp Kitchen on Saturdays from 10:00 am to 2:00 pm in July and August. Arrive early for the best selection, as seasonal fresh items disappear quickly! Please contact Lucy at 306-353-2222 if you'd like information on becoming a vendor. Weekly Jam Sessions are held at the Camp Kitchen on Saturdays from 12:00 pm to 4:00 pm. Come and be entertained while you peruse the items available at the Farmer's Market! Enjoy the weekly Pancake Breakfast, put on by the local Riverhurst Lions club, held Sundays from 9:00 am to 11:00 am at the Camp Kitchen starting the last weekend in June and finishing on the Labour Day weekend. Come celebrate Canada Day at Palliser Regional Park! Starting shortly after dusk, there will be a Fireworks Display at Rusty's Coulee Marina to celebrate Canada's birthday. Please note - for the fireworks display, a nominal $5.00/vehicle charge applies with all proceeds going to the Riverhurst Fire Department.